In March, the major question everyone wants to know is: "Which small-conference team is going to pull an upset or two and possibly reach the second weekend?" Every NCAA Tournament has at least one; you just have to figure out which one or two it is going to be. Don’t mistake this for a “Who is this year’s Butler?” column, though—that’s simply not going to happen again (or will it?). Maybe it’s more like a “Who is this year’s Northern Iowa/Saint Mary’s/Cornell?” column. There were five non-BCS teams to reach the Sweet Sixteen last season; will we see a repeat? Note: I'm not including teams from the following non-“Big Six” conferences: Atlantic-10, Conference-USA, Mountain West and WAC. I’m also not including Gonzaga and Butler. Saying Dayton is a sleeper is not the same as saying that UC-Santa Barbara is a sleeper. 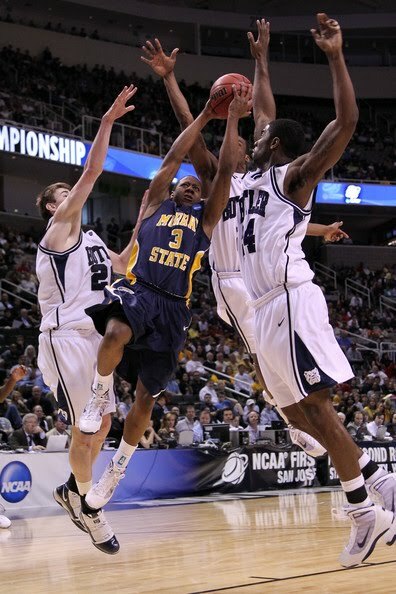 Murray State: The Racers are coming off a victory over Vanderbilt and a narrow loss to Butler in the NCAA Tournament, and they could take the next step this year. They have one of the best backcourt trios around in returning starters Isacc Miles and B.J. Jenkins, and sixth man extraordinaire Isaiah Canaan. Up front, the team’s leading scorer, Ivan Aska, returns to anchor the post. Rebounder Jeffery McClain will move into the lineup. The Racers have tremendous balance and play lockdown defense – look out for them. Old Dominion: Another team that won a first-round game last season, the Monarchs knocked off Notre Dame but will be hungry for another victory this year. They lose only one key player, but Gerald Lee was the team’s lone double-figure scorer. Versatile sixth man Keyon Carter, who will team with Frank Hassell up front, will replace him. On the perimeter, Kent Bazemore is a match-up nightmare, while Darius James and Ben Finney also return. ODU also defends as well as anyone. Wichita State: The Missouri Valley consistently places an upset threat into the NCAA Tournament, and this year’s team could be Wichita State, aptly named the Shockers. The inside-outside duo of guard Toure Murry and big man J.T. Durley lead the way. Starters Graham Hatch and 7-footer Graham Stutz also return, with Gabe Blair bringing defense. The key for the Shockers this season will be their ability to win on the road; they were 17-0 at home last year. Fairfield: I’m higher on the Stags than some others, but I really think they can be this year’s Siena: the MAAC champion who scares the bejeezus out of their first-round opponent. Sophomore point guard Derek Needham is one of the best floor generals in the country, and Yorel Hawkins, Greg Nero and Warren Edney return from injury to anchor the frontcourt. The Stags nearly knocked off Siena in last year’s title game, but they will get over the hump this season. Loyola Marymount: Gonzaga is still the top dog in the West Coast Conference, but don’t sleep on Loyola Marymount this season. They jumped from three wins to 18 last year, even getting an invite to the CIT. One of the top duos in the mid-major world, guard Vernon Teel and forward Drew Viney, will lead the way for Lions. Forward Ashley Hamilton and double-figure scorer Jarred DuBois also return in the lineup. A loaded frosh class also enters the fold. If everyone stays healthy, this team will threaten the Zags. Wofford: The Terriers are a veteran team that got some experience in the NCAA Tournament last season, falling to Wisconsin in the first round. This year, four starters return, led by Noah Dahlman, a physical 6-foot-6 forward. Tim Johnson is another very good rebounder up front. On the perimeter, Jamar Diggs, Cameron Rundles and Brad Loesing all come back. Wofford was one of the stingiest defensive teams in the country, allowing just five teams to top 60 points. Saint Mary’s: Omar Samhan is no longer around to dominate the paint, but don’t forget about the Gaels in the WCC. Mickey McConnell and Matthew Dellavedova form one of the best backcourt duos in the country, bringing tremendous three-point shooting and passing ability. The key this season will be the newcomers, as freshman Stephen Holt is a big-time guard, while transfers Rob Jones (San Diego) and Kenton Walker II (Creighton) will anchor the frontcourt. UC-Santa Barbara: The Gauchos are a deep and versatile team that will look to build on their NCAA Tournament loss to Ohio State last season. Juniors Orlando Johnson and James Nunnally are match-up problems as they are both capable of doing a little of everything. Johnson led the Big West in scoring, while Nunnally is a deadeye three-point shooter. Jamie Serna and 7-3 Greg Somogyi are factors up front, while Will Brew returns at the point guard spot. When it gets inside production, UCSB is tough. North Texas: The Mean Green are aiming for their fifth consecutive 20-win season, and they have the weapons to get that done. They return a talented and experienced backcourt duo in Josh White and Tristan Thompson, who both averaged more than 14 points and hit 40 percent from three-point range. Up front, double-double lock George Odufawa is the anchor. 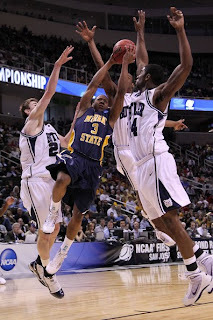 Shannon Shorter is a terrific wing defender. This team is bouncy and aggressive, and is constantly on the attack offensively. Ohio: The Bobcats caught the nation’s attention in last year’s NCAA Tournament, when they upset Georgetown in a first-round blowout. The loss of Armon Bassett will hurt, but D.J. Cooper is up to the task. The sophomore is one of the better mid-major point guards in the country. Tommy Freeman is a tremendous three-point shooter, and Steven Coleman can also fill it up on the wing. Up front, DeVaughn Washington and Reggie Kelly provide a nice balance of physicality and athleticism. East Tennessee State: This team has weapons all over the floor, and will welcome back Mike Smith from an injury that kept him out of all but four games last season. Justin Tubbs and Micah Williams are shooters who averaged double-figures, while Tommy Hubbard is a double-double threat every night out. If this team is forcing turnovers, they can hang with anyone. Quinnipiac: Robert Morris threw a huge scare into Villanova last season, but the team that won the NEC was Quinnipiac. Justin Rutty is one of the most productive forwards in the country, while James Johnson is a double-figure scorer at guard. Another key will be freshman Tevin Baskin, who will become eligible in late December. He will provide an immediate impact on the wing. Weber State: The Wildcats should have been in the NCAA Tournament last season, but they blew a 20-point halftime lead to Montana in the conference tournament title game. There shouldn’t be any slipups this season. Damian Lillard is one of the best all-around players on the West Coast and a two-time conference player of the year. Kyle Bullinger provides balance in the frontcourt. Oakland: Any time Keith Benson lines up, the Golden Grizzlies have a chance. He returns for his final go-round, and will look to build on his dominant campaign of a year ago. Larry Wright provides shooting on the perimeter, and UMKC transfer Reggie Hamilton will try to replace passing dynamo Johnathon Jones. This team has the balance to get the job done, while Benson is capable of putting Oakland on his back. Morgan State: Look for the Bears to reach the NCAA Tournament for the third straight season, despite the loss of Player of the Year Reggie Holmes. Kevin Thompson is a double-double fiend in the frontcourt, while DeWayne Jackson is a match-up nightmare due to his shooting ability. Sean Thomas and Jacksonville transfer Aric Brooks will produce in the backcourt.